The History of the California Park VFD. We know that California Park VFD was one of the founding members of the Marin County Association of Fire Departments in 1928, but have little other information or photographs at this point. We believe their fire station was located roughly under the current Highway 101 overpass going over Anderson Drive in San Rafael. Please help us find more. 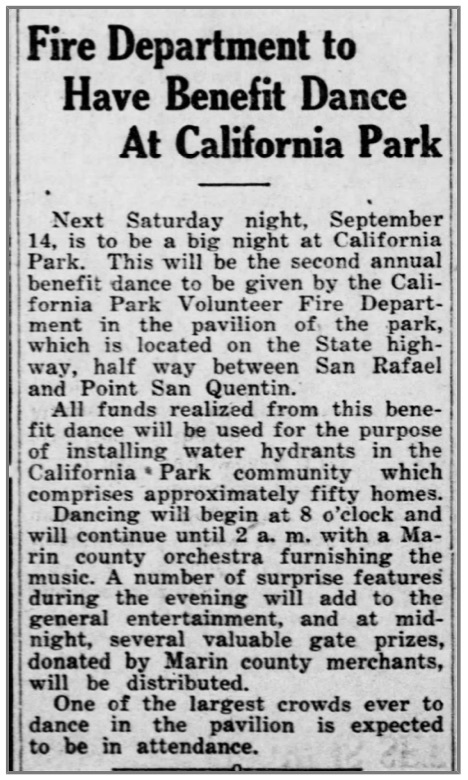 The second annual benefit dance to be given by the California Park Volunteer Fire Department, will be held on Saturday evening, September 14. The funds realized from the dance this year will be used for the purpose of Installing fire hydrants in the California Park community, which Includes approximately fifty homes. Assuring a good time for all who attend, the dancing will begin at 8 o'clock In the evening and last until 2 o’clock In the morning. All tickets for the dance include a coupon to be deposited In a box, and later In the evening there will be a drawing for the gate prizes. With the funds realized at the first annual dance last year, water mains were Installed In the community. This year the money will go for the fire hydrants. An excellent orchestra of six pieces will furnish the music for the occasion.